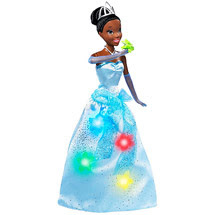 I am looking for the "just One Kiss" Tiana Princess Doll for Syndey's birthday on January 2nd. Everywhere is sold out even on line. If any of you find it will you please let me know. Or pick it up and I will pay you for it. It runs anywhere from $25 to $30. Thanks so much. This is the ONLY thing she is asking for, for her birthday so I really want to get it for her. We had our Rhodes family Christmas Party on Saturday night at the church. All day long Sydney was very worried about Santa coming. She is terrified of him. She had her Christmas list that she wanted me to give to him, but I told her no (I'm a mean mom). I told her that in order to get her present from him, she had to go up there and at least stand by him to get it and she could then give him her Christmas list. So when he came she of course flipped out but she calmed down when she seen everyone going up there was ok with sitting on his lap. So when they called her name she went up there and gave him her Christmas list. Then the next thing you know she is up on his lap. She came back and informed up that she is no longer afraid of Santa and Josi took a picture to prove it. Thank goodness. But now Shelby is so we have to start all over again. Preston could have cared less about him, he didn't mind sitting on his lap at all. We had a family friend take our pictures finally (now that Preston is almost 10 months).